While most readers will be aware of Dickens’ A Christmas Carol, not everyone would realise that this was just one of a number of seasonal tales by Victorian writers, with many big names getting in on the act. Never one to miss out on a chance to promote his writing, Anthony Trollope was no exception to the trend, crafting several short(er) pieces for the occasion, and today’s festive post looks at a selection of these stories, a beautiful little book with a nifty cover. There’s not much snow around these parts in December (at time of writing, the prediction for today’s weather in Melbourne is 36 degrees Celsius, or 97 degrees Fahrenheit…), but at least my reading gives me a little taste of winter in the frosty north. 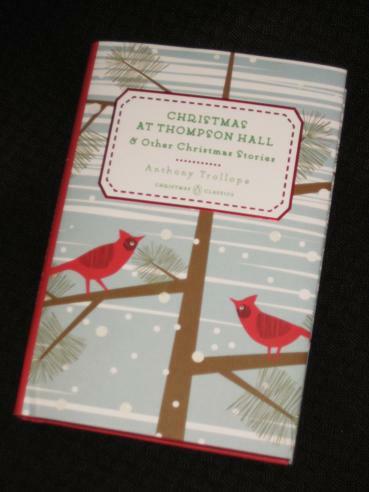 Christmas at Thompson Hall & Other Stories is one of a collection of Christmas classics released by Penguin a couple of years back, and Trollope’s contribution consists of five stories, several of which almost verge on novellas. Each of the tales is designed to warm the cockles of your heart on Christmas Day, with turkey, mistletoe and the milk of human kindness present in abundance. Those readers familiar with Trollope’s work may be surprised by a couple of the stories, but for the most part the writer uses some tried and trusted tropes in his festive fiction. For me, the weaker pieces in the collection have exactly that flaw, in that Trollope attempts to do in fifty pages what he usually does in five hundred. Exhibit A here is ‘The Mistletoe Bough’, the only story I’d read before, and a rather dull tale where very little happens. A young woman is forced to spend Christmas Day in the company of a young man she had rejected a while back, and it would take a very dense reader not to predict each plot ‘twist’ well before it occurs. It’s not the best example of Trollope’s writing, and it’s only his genial characterisation and sense of fun that save it from being a total disaster. But of one thing she was quite sure, as she lay there, wretched in her solitude, – that now she would never alter her demeanour to him. He had chosen to be cold to her, and she would be like frozen ice to him. Again and again she heard their voices, and then, sobbing on her pillow, she fell asleep. Of course, in traditional Darcyesque manner, Archer will soon become a little less aloof, and all will end happily in time for Christmas dinner to go smoothly. Again, there’s nothing special about this one, but it does provide an interesting glimpse of Christmas traditions of the time. Then came the sacrament, more powerful with its thoughts than its words, and the two men as they left the church were ready to forgive each other – if they only knew how. Short and sweet, it’s an amusing tale of two stiff old Englishmen and the ability of Christmas to melt their grumpy facades. By far the best story, though, is the title piece. We begin in Paris, where Mr. and Mrs. Brown are spending one night on their mad dash up through France from Pau to be at her family residence, Thompson Hall, for Christmas Eve. Mr. Brown, a hypochondriac looking for excuses to abandon the journey, continually claims that his throat will prevent him from continuing on to England, eventually deciding that only a mustard plaster poultice will do the trick. But it’s night-time in a Parisian hotel, and there’s no room service to be found – so Mrs. Brown sets off on a nocturnal mission to help her husband, one destined to end in mayhem. She paused, and listened, and trembled. Then she thought of the glories of Thompson Hall, of the genial warmth of a British Christmas, of that proud legislator who was her first cousin, and with a rush she made good the distance, and laid her hands upon the copious delft. She looked around, but there was no one there; no sound was heard; not the distant creak of a shoe, not a rattle from one of those doors. As she paused with her fair hand upon the top of the jar, while the other held the white cloth on which the medicinal compound was to be placed, she looked like Lady Macbeth as she listened at Duncan’s chamber door. There are references here to Shakespeare and The Night Before Christmas (and even, for the watchful reader, a clue as to what will happen next). Of course, the expedition ends in disaster, and just when you think it can’t get any more embarrassing, her fateful mistake ends up following her across the Channel. Never fear, gentle reader – this is a Christmas tale, and all will be reconciled before the turkey’s consumed. Thank you for a wonderful overview of Trollope’s Christmas stories. I always love finding Trollope mentioned and to have such perspicuity on this day is a true holiday gift indeed. Gubbinal – Thanks 🙂 I’m a huge Trollope fan, so this seemed rather apt for the occasion! I agree with you that “Christmas at Thompson Hall” was the best story in the collection. I laughed really hard when she realized she put the mustard plaster on a complete stranger! Kaggsy – Definitely keen to get a couple more (might even get around to reading one by next Christmas, too!). A great plan (although that’s quite a wait…).